Released in 2009 by Insightly, Inc., Insightly is a cloud-based CRM and project management platform aimed at small to midsize businesses. 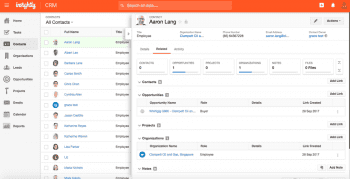 Initially designed to integrate with Google Apps products, Insightly relocated to San Francisco in 2012 and began developing its CRM tools for other platforms. Since then, Insightly has released apps for iOS, launched integration with Microsoft Office, Outlook, Dropbox and Quickbooks Online, partnered with Xero and added Microsoft Power BI integration. In April 2016, Insightly announced it had raised $25 million in Series C financing. According to Insightly, they now service over 1 million customers in over 200 countries. All paid plans receive a discount when billed annually rather than monthly. Also, all paid plans offer MailChimp Integration, Google Contact and Calendar Sync, Microsoft Exchange Calendar Sync and Custom Branding. Insightly offers an online knowledge base and community Q&As. All paid plans offer email support and dedicated onboarding. The Professional and Enterprise plans offer priority email support. Insightly offers something for everyone. Their Free plan offers bareboned CRM features for tiny businesses – think solo freelancers or a home-based team. Insightly doesn’t natively offer custom reports as some CRM software does, but the very small businesses using this plan (or perhaps upgrading to the paid Basic plan) might not have complex reporting needs. However, Insightly doesn’t lack features for larger companies using its fuller-featured Professional or Enterprise plans. Insightly has official integrations with several widely-used applications and suites, like Google Apps and Office 365 Business Edition for cloud productivity tools, Quickbooks Online and Xero for accounting, SupportBee for customer support, several applications for data migration and document management (the latter including DropBox, Drive, OneDrive and Box), multiple applications for sales (including Quotient, Hangouts and Facebook Lead Ads) and Microsoft BI for more complex reporting. 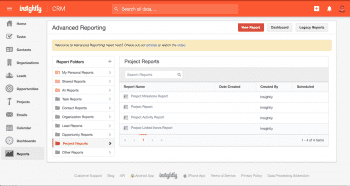 Additionally, the Insightly API can export CRM data into an external reporting service allowing for customized reports. 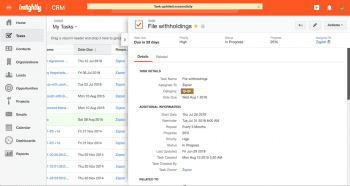 Note that every entry created in Insightly – contacts, projects, tasks, opportunities, leads – constitutes a record; even very small businesses using the CRM under the Free plan can find their 2,500 allotted records running out shortly. Of course, the storage capacity expands with larger plans. Insightly also offers effective user, contact and lead management tools with permission levels that any company hierarchy would find useful. In the Basic and Plus plans, managers can coordinate lead assignments among sales teams through drop down menus; the Professional and Enterprise plans enable automation through fairly simple rule configuration. Insightly also has a mobile app available for iOS and Android users, which allows use of their business card scanning feature. The email capabilities of the mobile app is lacking, but recent updates have improved functionality relative to the desktop app; the Pipeline and Activity Set features have been added, which allows for effective workflow management on the go. Finally, being SOC2 compliant – like virtually all major CRM providers – means Insightly implements security measures that meet the industry standard for protection of customer data in the cloud. This includes monitoring the system for unusual activity, unauthorized configuration changes and user access levels. Ultimately, Insightly provides robust CRM functionality for companies of most sizes, and it’s far easier to use out of the box than rival CRMs like Salesforce and Zoho. Insightly is also generally cheaper as well. 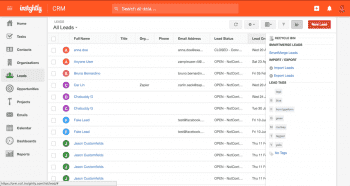 While it lacks certain customizations and backend features of its rivals, it’s simple for users and administrators alike; as any CRM requires a competent administrator, this allows a business using Insightly to get their CRM up and running in short order. Therefore, for a company of up to, say, 20 employees, Insightly should definitely make your shortlist. Larger than that, you probably have the budget to consider the more expensive options with greater automation, customization and integration features – as well as the administrator and staff training to use them. What Do You Think of Insightly?